The Panteón Civil de Dolores in Mexico City is the most famous cemetery in Mexico. 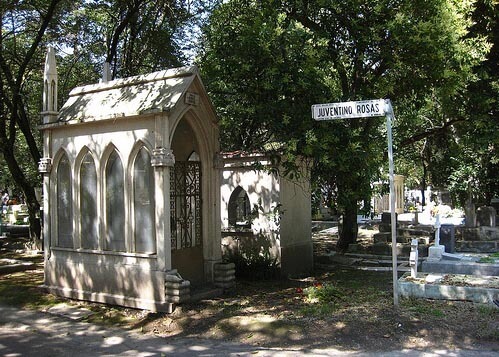 Many of Mexico's famous individuals have been buried in this cemetery. However, due to current conditions in Mexico City, it is not a good idea to travel alone. Make sure that any visit to this site is with at least one other person. This will greatly decrease the chance of any mugging or other incident occurring. Some of the most famous individuals buried in this cemetery are artists from Mexico. The most famous artists buried at this site are Diego Rivera and David Alfaro Siquieres. Along with these artists also lie famous politicians and other figures of historical significance in Mexico's history. When you visit this site, make sure to visit during the day and before dusk. Last updated by Chris on 22 March, 2010 in Destinations.